The book is divided into three parts. 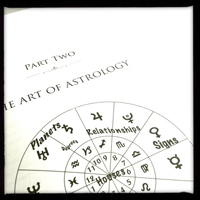 The journey begins by reading Part One, which teaches the principles of astrology. Part One is meant to be read through like a textbook. Part One presents the foundational information necessary for you to understand the language of the zodiac and begin using the principles of astrology in your life, not only to read charts but also to live consciously. Part Two and Part Three as references. Birth charts can be obtained online for free from this website. There is no need to explain how to calculate a birth chart since today computers can do in less than a second what used to take about forty minutes to construct. The birth chart is calculated through knowing the date, time, and place of birth. The birth chart is like a snapshot depicting where the Sun, Moon, and planets were in the sky at the moment of birth, which puts each planet in a certain relationship to the person’s position or location on the Earth. Once you have a birth chart, this book can help you to read and interpret it. Part Two contains instructions for reading a chart, instructions for using the reference chapters, and the reference chapters. 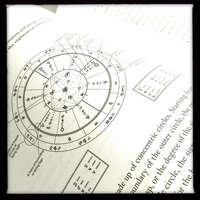 Part Two explains how to read the symbols of a birth chart and distinguish the planets, signs, houses, degrees, etc. depicted in the astrology chart; the process of intuitive astrological interpretation; the meanings for each of the planets in each of the signs; what each of the twelve individual Rising Signs mean in a birth chart, and an indication of what a person is learning in order to fulfill his or her destiny; what each planet signifies in each house; the meaning of the aspects, which are the relationships each planet has to every other planet; and the issues that could arise as the result of the energy of one planet combining with the energy of another planet. 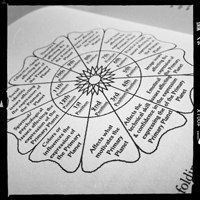 Part Three is the wheels of life, which depict the relationship of each sign to every other sign, 144 combinations. 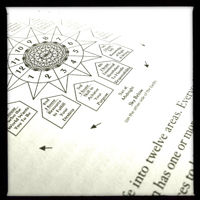 This chapter comprises the bulk of the book and is where the Divine wisdom inherent in astrology is practically conveyed. It is through the use of this chapter that intuition is exercised and developed. An explanation of the wheels and their many uses is given at the beginning of Part Three. Each wheel depicts the Divine potential that is stimulated when the energy of one sign is combined with the energy of another sign, and the great gift, message, lessons, or possible issues that could manifest as a result. The potentials and issues expressed in the treatments for each of the 144 combinations are not meant to be absolute, nor apply always as stated, nor be the only way to interpret these combinations, but are rather meant to stimulate your own intuitive awareness and help you to come up with your own intuitive perception and understanding. 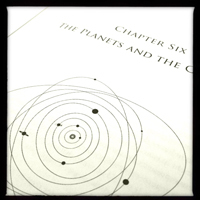 The reference chapters in Part Two and in Part Three are not meant to be read through like a textbook, although it would be all right and beneficial to do so, but rather are meant to be referred to while reading a chart, bit by bit, or randomly, so that the system of astrology, mirroring the system of Nature, gradually reawakens a person’s intuitive understanding. Understanding with only the intellect can prevent a person from grasping the deeper spiritual implications and significances, and from learning to get in touch with and trust his or her own feelings and understanding of the chart. The important thing to remember is that with intuition, the way something makes us feel is more significant than the way we understand it intellectually. The intellect alone cannot grasp the significance of Love: only feelings can grasp, relate, and experience Love. Feelings alone are what ultimately connect us to the Divine, though the intellect can help. Astrology Blog on Another New Video! What is wholeness?